I learned about my lung cancer in a roundabout way in the summer of 2017. I started having headaches and experiencing vertigo. I also noticed some slurred speech and trouble with fine motor skills like writing. I went to a series of doctors to try to determine the cause, including my PCP, an ophthalmologist, a massage therapist, and an ENT. Eventually, a neurologist ordered an MRI. I went in for the MRI and afterward the radiologist wanted to see me to “look at something.” From then on, it was like a cascade, with lots of people coming in and out of the room conducting various procedures and making calls to my wife. I ended up getting the news from the attending ER physician and several interns or residents. They still had to do a biopsy to be sure, but based on the MRI and chest CT scans, they were pretty sure it was lung cancer. I don’t remember being floored by the news and I didn’t collapse or anything. Maybe I was numb to it but in the moment, it seemed obvious like, “Of course that’s what it is!” I actually felt bad for the residents and interns who had to tell me. It was like they were training on how to tell someone they have cancer. My wife, Judy, and my sister-in-law, Mary, who is an RN, arrived and I was grateful to have them there for support. Two days later, I underwent surgery to remove the largest brain tumor. They did a biopsy using that tissue, which confirmed my diagnosis: stage IV adenocarcinoma. Judy and Mary made appointments for me with a thoracic oncologist and a neurological oncologist at Memorial Sloan-Kettering. Initially, the plan was for me to start chemotherapy and radiation. My oncologist also ordered the MSK-IMPACT genetic test panel to identify any treatable mutations. The day before I was to start chemotherapy, my thoracic oncologist called to tell me that the test came back EGFR positive and I didn’t need to go through with chemo. She told me that I was a candidate to take Osimertinib, a targeted therapy drug. I still had to do five rounds of radio-surgery as well, but the treatment options changed completely. There was no question about whether I was going to take that or not. One of the biggest challenges was recovering from surgery and getting back to work. That wasn’t easy, but the support from my family, friends, and employer has been tremendous. I have the good fortune to work for a company that puts people first, and they have been very accommodating. From the beginning, my large family started coming to visit and help with things like cleaning our house and delivering meals. I’ve been a pretty avid runner for several years. Before I was diagnosed, I ran 8 ultra-marathons, 7 full marathons, 10 half marathons, and a bunch of shorter races. Getting back into running regularly took a back seat to recovering from my surgery and the initial rounds of radiation. I was able to start running pretty regularly about 2 months after diagnosis. So far this year, I’ve run some 5Ks and trail races, three half marathons, one full marathon, and one 50K ultramarathon. The marathon, especially, was a big milestone for me. I ran the New Jersey Marathon, which I had finished three times before cancer. Being able to run it again after my diagnosis was a really uplifting and fulfilling experience for me. 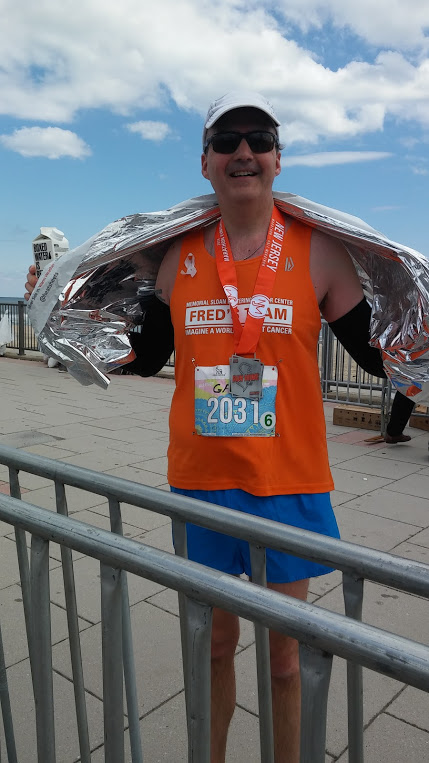 I’ve been fundraising for Fred’s Team, the running charity for Memorial Sloan-Kettering Cancer Center. Since my diagnosis, I’ve done a lot of research and made a lot of connections online, both of which have helped me understand and deal with cancer better. 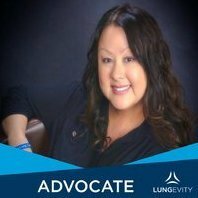 LUNGevity’s Facebook groups have opened up a large network of people who are more than happy to provide support and information, answer questions, and share their experiences. I think in the past, and to some extent still today, most people only considered a ”survivor” to be someone who had been diagnosed with cancer, underwent treatment, and was in remission or totally cancer-free. That definition leaves a lot of people out, myself included, who are on long-term treatment. To me, a “survivor” is anyone who has been diagnosed with cancer and is still alive. Some of us may never be totally cured but we could survive for a long time thanks to new treatments liked targeted therapies. Hopefully, we’ll survive cancer long enough to live a full life and eventually die of something else, like a skydiving accident at the age of 97!